Acupuncture for Martial Artists is a field I have always been interested in, as it is the martial arts that indirectly lead to my choosing this profession. I dragged myself to the doctor’s (under protest I may add). The diagnosis was simple. My knee’s were worn out. I’d have to get new ones, learn to walk again and never return to train in karate. To say I was crushed was an understatement. Being young and stubborn, by which I mean down right stupid, I refused treatment, argued that there had to be another way. I was advised to see an acupuncturist, so being desperate, I did. I was diagnosed with Cold Invasion of the Joint…now that sounds weird doesn’t it. But it’s actually quite a good explanation…As I was to learn later in Traditional Chinese Medicine many patterns of disease and illness are described with metaphors. Think about your fingers when it’s really cold outside, the joints become cold, stiff, and have that tight constrained sore feeling when you move them – pretty much what was happening in my knee. So I started on Acupuncture for Martial Artists. The acupuncturist took 5 needles and put them in the “eyes of my knee”. 6 Sessions later I was pain free. At the end of my 12th my knees felt incredible - Strong supple and capable of delivering confident kicks and sustaining deep stances. Acupuncture for Martial Artists had such a profound effect on my life that I began studying Acupuncture and Traditional Chinese Medicine so that I could treat my family and friends to the same quality of health I now enjoyed. Since then I’ve always had a soft spot and particular interest in Acupuncture for Martial Artists. 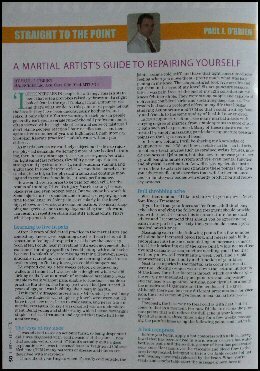 In fact I am privileged to write a regular medical column for Ireland’s leading martial arts magazine – Irish Fighter. You can view many of the original articles in the Media Section of the website, here. I’ve also reproduced some of the articles text in the following articles. There is a price to be paid for such skill, for the results of training. Often it is injury. Muscle strains, bruises, black eyes and even broken bones. And we know it’s worth it. Some injuries are less sudden and dramatic, creeping up over time to challenge us. Joint pain, particularly in the knee’s hips, elbows and wrists is a common feature. Too many snapping mai geri’s or one too many days striking the makiwara can result in repetitive strain and stiff aching joints. Luckily Acupuncture for Martial Artists is a viable and effective form of treatment that substantially improve recovery rates and performance. If you are a martial artist or athlete and have sustained an injury or hampered performance then perhaps you should consider Acupuncture for Martial Artists. If you have any questions or concerns regarding the Traditional Chinese Medicine and Treatments that I provide or wish to start a course of treatment then please feel free to contact me or make an appointment where we can discus any specific concerns or questions you may have. You have been reading about Acupuncture for Martial Artists. It may interest you to read about Acupuncture for Martial Arts Knee Injuries.